Eight-one year old Georgina Smith was released yesterday from Cornton Vale Womens Prison ten days early after an anonymous benefactor paid the compensation order she had refused to pay. 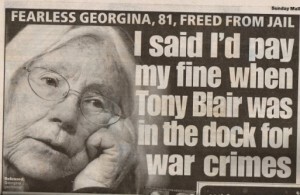 Georgina served thirteen days of the 45 day sentence for refusing to pay £1,500 compensation for painting the sandstone wall of the Edinburgh High Court with the words “Genocide” and No More War Crimes” in a protest against Trident on Remembrance Day 2006. She and Helen John had already served another 45 day sentence for the bold action. She was very grateful for all the cards and letters and support she received from many people. The peace-loving pensioners’ paint job was a protest against the High Court’s complicity in the illegal deployment of “genocidal” nuclear weapons. The High Court ruled in the Lord Advocates Reference (LAR 2000) that Trident is legal even though the International Court of Justice had ruled in 1996 that the threat and use of nuclear weapons would generally be illegal. Last year the Scottish Government determined that it is bound by that LAR ruling and that under the Scotland Act it has no power to act on defence issues. 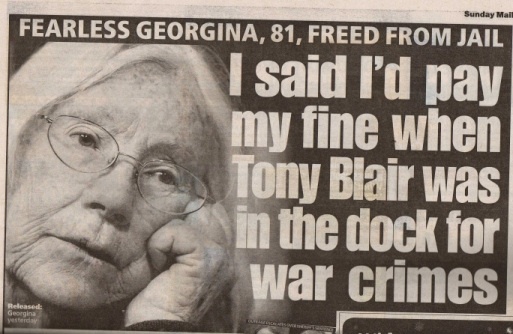 But in January Trident Ploughshares made a submission to the Scottish Government calling on it to demand the removal of Trident from Scotland saying that it has the legal grounds to refuse to aid and abet the UK government in war crimes. The campaign group is currently awaiting a response from the Scottish government. The painting of the High Court was also in protest against what the women said was unlawful detention of hundreds of protesters without charge for up to 30 hours as part of the year-long Faslane365 campaign in which over a thousand people were arrested for blockading the Faslane Naval Base, homeport of Trident, the UKs nuclear weapons system. When the two women were released without charge after being held overnight for blockading Faslane they were incensed at not being brought to court and allowed to make the case against Trident. The government continues to deploy Trident submarines, each carrying 48 nuclear warheads. Each Trident warhead is 8-10 times the size of the Hiroshima bomb, the use of which would inevitably kill hundreds of thousands of civilians and cause untold environmental devastation in violation of international humanitarian law.